While there is excitement in going to get all the supplies needed for a aquaponics designs, its smart to first have an understanding of exactly what goes into a good system. In its truest form, aquaponics is about combining two very different approaches to growing plants, namely aquaculture and secondly hydroponics. The purest method is really about taking the best of both of these methods and creating a system that many enthusiasts say is both cleaner and simpler to manage. A simple aquaponics design is when the water is continuously running. The water is pumped from your water or fish tank to the grow bed area. 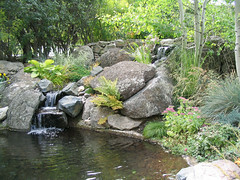 The water then flows through the growing bed area,to the roots of the plants, and back to the fish tank. Nutrient rich fish water is pumped from the fish tank into the roots of the plants, where plants growing in the gravel extract the nutrients from the water. The water then drains back into the fish tank oxygenated. Many first timers will build their tanks, purchase their fish, and plant their seeds all in the same day or weekend. This will cause your garden to fail. The system depends upon the nutrients in the water. This means that you must place your fish in the water first and allow their waste to be broken down into nutrients. This way your seeds will be able to grow with the nutrients in the water. The process of building your system from start to finish will take approximately two to three months. This process can be shortened by adding nitrates to the water. The nitrates and ammonia must be monitored, especially in the beginning stages. This will ensure that your fish and plants are healthy and working together. Everyone has a different size of space they can devote to an aquaponics design. When researching the design to use, it is important to consider if you would like to upscale the size of the system at a later date. You might even consider if you would eventually like to have a commercial sized system. Be sure that your space will accomodate your plan before investing in the necessary pieces. One you have evaluated all of this, you can then start building your own aquaponics self-sustaining system to be the best one for your area. The advantages of a great aquaponics design is that it’s a self balancing system. As more nutrient become available through the fish, plant growth will increase. The advantage of aquaponics is that it is an eco-friendly system. There are many aquaponics designs that can be installed, depending upon the time and space you have available as an investment. Want to find out more about Aquaponics Designs, then visit Gary White’s site on how to choose the best Easy Aquaponics for your needs.